On my way home from work this week I heard parts of an interview given by Geshe Thupten Jinpa, the Tibetan translator and interpreter of his Holiness the XIV Dalai Lama, in the radio show On Being, hosted by Krista Tippet (American Public Media). I had always imagined that interpreting for someone like the Dalai Lama would be an insurmountable task, not only for the complexity of the topics and metaphysical concepts he discusses, but also because of translation issues that would arise between two such different languages, such as English and Tibetan. For instance, in the interview, Thupten Jinpa talks about the “popularized” Western translated term “meditation” not being able to carry all the nuances of the same concept it has in Tibetan Buddhism. According to him, some of the term’s connotations include the concept of “cultivating a field,” and “process of familiarity.” So, when people in the West hear the word “meditation” they immediately associate it with the image of someone sitting quietly by themselves, emptying their minds, when actually the original Tibetan and Sanskrit concepts involve much more than that. More importantly, they include an “analytical” component. It’s not simply about sitting quietly emptying your mind, it is also a process in which one uses discernment to move between stages, uncovering layers (isn’t this a perfect description of translation?). But, Thupten Jinpa doesn’t feel that “meditation” is an inaccurate translation the original concept, so there isn’t any mention of nuances that are lost. He only hints that “meditation” has “left out” such nuances. But he immediately, and graciously, states that, “…it’s part of the process. At some point the nuances will come back.” So, I would like to propose here that we start looking at these two activities through such lens; that to translate and interpret is, and should be, about “meditating” in the deepest sense of what the translated term has left out! Moreover, the AMP website has a link to a video depicting His Holiness the XIV Dalai Lama, joined by other religious leaders (Judaism, Christianity, and Islamism), speaking about happiness at Emory University in 2010. 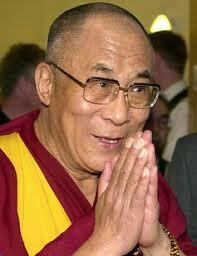 In the video one can clearly see the symbiotic relationship between the Dalai Lama and his interpreter. His Holiness speaks mostly in English and relies on the interpreter to “finish his sentences” whenever he’s in search of translations for the Tibetan concepts he wants to express. This got me thinking about the relationship of trust that develops between speakers/listeners and their interpreters. It also got me thinking about the level of knowledge interpreters should strive for in order to be able to provide such level of trust to their interlocutors (Thupten Jinpa is also a former monk, philosopher, has translated many of the Dalai Lama’s writings, and much more). And it also got me thinking about the interpreter’s invisibility and/or visibility and the balance between such binary. If you watch the video, Thupten Jinpa is often very visible, present; an active participant in creation of meaning. Even when we don’t see him, he’s extremely visible (and this is one of the key paradoxes in translation and interpreting). But there is also another thing going on when you watch Thupten Jinpa “at work”; another thing that is even more important! He looks extremely happy! The discussion among the religious leaders is about happiness and I would like to bring that concept to discuss the activity of translation and interpreting. One aspect that is commonly left out of academic discussions on translation and interpreting, training of translators and interpreters, and in the profession in general is the issue of affect. The element of enjoyment plays a huge role in how well one performs such tasks (or any other activity, for that matter). At a point in his interview to Krista Tippet, Thupten Jinpa addresses that by saying, “one of the things I cherish about the experience of translating for Him [Dalai Lama] is the joyful state of mind I can automatically get into…” I propose that we all think about that next time we are either thinking, writing about, teaching or performing translation and interpreting! This entry was posted on February 27, 2013 at 1:34 pm and is filed under Stories. You can follow any responses to this entry through the RSS 2.0 feed. You can leave a response, or trackback from your own site.